This 4 bed 2 and a half bath pool home is located in Lindfields a well- established vacation home community. It is sought after for its proximity to Disney and the shops and restaurants of 192. This spacious home is located on a corner lot and has a good sized south west facing pool. It has Wi-Fi, cable TV and free calls to Canada and Puerto Rico. The home is spread over 2 storeys. The master bedroom is downstairs. It has a king sized bed, TV and bathroom with walk in shower and tub .Upstairs there are 3 further bedrooms. A room with 2 twin beds and a Mickey Mouse theme will appeal to the youngest member of the family. The other 2 rooms are tastefully decorated. One has a full size bed. The other has a queen and a TV to help you unwind after a long day at the theme parks. Home very nice great neighborhood close to attractions. Pool area nice and clean the game room in the garage was awesome. 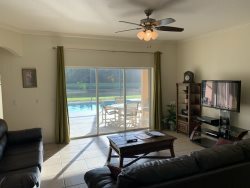 We loved the house,location and the privacy.Everything was great!We would recommend this place!My kids loved the rooms,the private pool,and the great game room in the garage.